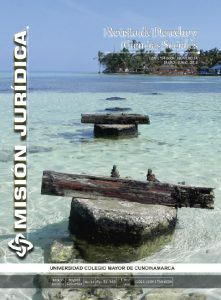 Legal Mission Magazine accepts original articles of the following types, in accordance with the requirements of the Publindex of Consciences program. 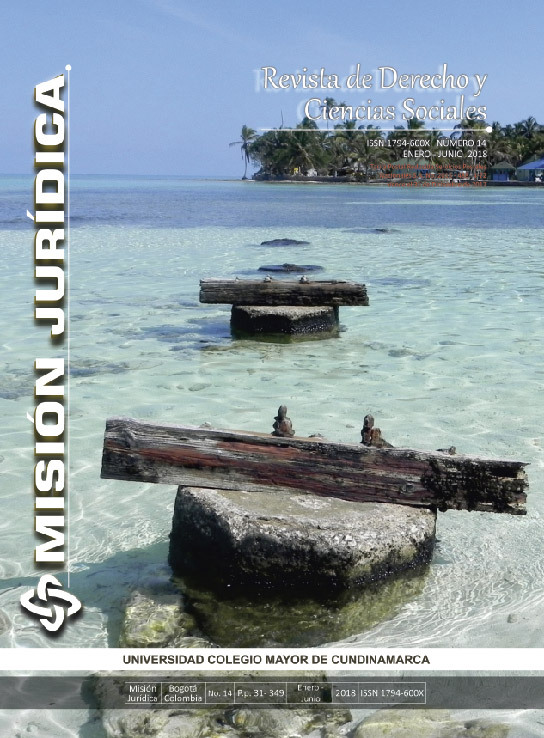 Mision Juridica is a bianual scientific journal primarily aimed at the international academic community specialized in Law and Social Science. Our journal publishes scientific original articles in Spanish, Portuguese, English and Italian. 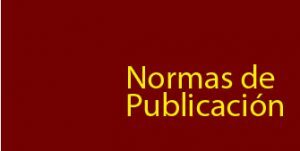 Our goal is to make public the results of research in law and socio-legal studies carried out by national and international researches according to publishing standards that contribute and have an impact in the global debate on these topics. The articles are subjected to anonymous evaluation by specialized academic peer reviewers, taking into account the requirements of the indexing schemes of scientific journals. By submitting your research to our journal, the authors agree and authorize the editing, publishing, reproducing, distributing and public communication of his/her article physically as well as digitally, with scientific purposes of non-profit dissemination. Also, authors keep their copyright. They have to authorize the copying of their articles in other printed publications and/or digital media, with express recognition to the author’s work in Mision Juridica journal. This is an indexed journal with ISSN 1794-600X that complies with Publindex scheme (category C) and also Latindex, Dialnet, Miar and OAJI. 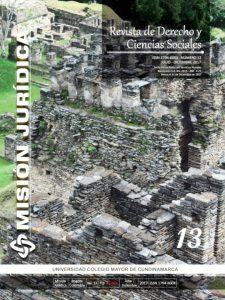 To guarantee open access this journal has Open Journal System and it can be consulted at http://unicolmayor.edu.co/publicaciones/index.php/mjuridica/index . 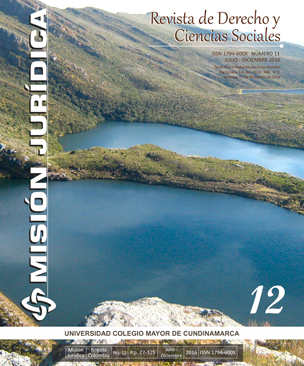 Mision Juridica is financed with the public resources of Universidad Colegio Mayor de Cundinamarca independent university, an independent legal entity, with special regime, academic, administrative and financial autonomy, independent assets which is connected with the Ministry of National Education. Every papper included in the magazine can be reproduced whole or in part, provided that respect for its original content, the source is acknowledged and is used with non-commercial academic. Legal mission and its content is protected under a license Attribution-Noncommercial-SinDerivar 4.0 international License of Creative Commons. 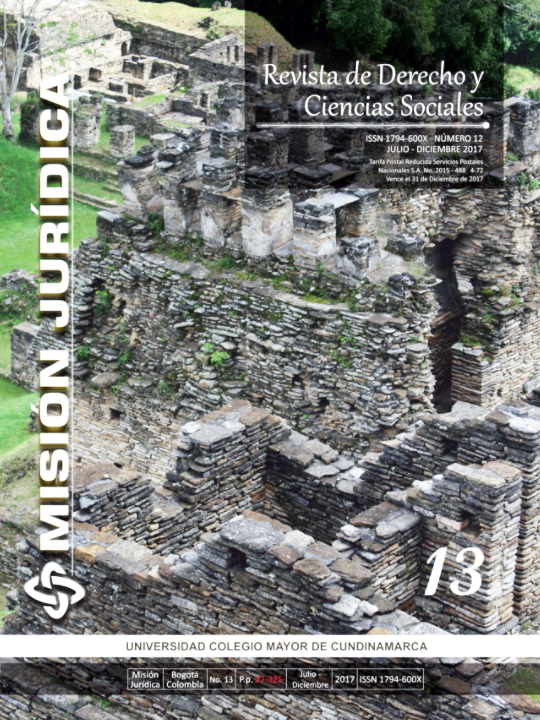 Misión Jurídica is distributed under a Creative Commons Attribution-NonCommercial-NoDerivar 4.0 International License. Based on a work in http://unicolmayor.edu.co/publicaciones/index.php/mjuridica/index. Permits that go beyond what is covered by this license can be found at http://unicolmayor.edu.co/publicaciones/index.php/mjuridica/index.